(1983) "Bang the Drum All Day"
(1983) "Loving You's a Dirty Job but Somebody's Gotta Do It"
"Bang the Drum All Day" is a 1983 song by Todd Rundgren. The lyrics describe, in the first person, the singer's drive to "bang on the drum all day" to the exclusion of everything else. All the instruments on this track are performed by Rundgren. The song has become popular as an anti-work anthem or anthem of celebration. Rundgren would re-record the song live for subscribers to his Patronet service. The new version was retitled "Bang the Ukulele Daily," referring to Rundgren's decision to perform it in a Hawaiian style, accompanied only by a ukulele. "Bang the Ukulele Daily" was included on his album One Long Year. The song is played in Lambeau Field after the Green Bay Packers score a touchdown. It was similarly used by the Indianapolis Colts until being replaced by The Black Keys' "Gold on the Ceiling". The St. Louis Rams also used the song as touchdown celebration music during home games at the TWA Dome during their Super Bowl-winning 1999 season. The song is used by conservative talk radio host Jim Quinn as his union heads-up theme. Boston conservative talk host Howie Carr also plays a snippet to poke fun at the Occupy Wall Street movement. The song is referenced in the video game The Elder Scrolls III: Morrowind by the popular scamp merchant, Creeper. That song is featured in the trailer of the 1998 DreamWorks animated Movie Antz, in The Prince of Egypt 1999 VHS opening, and the Shrek 2001 VHS opening. The song is featured on the radio show The Morning Drive on Sirius XM NASCAR Radio, a morning talk show hosted by Mike Bagley and Pete Pistone. The song is used on Friday mornings to celebrate the upcoming weekend. Likewise for many years, classic hits station WKLH in Milwaukee played it every Friday at 5 p.m. to signal the end of the work week. ↑ Wolfley, Bob. "Musician Rundgren happy his song is a big bang in Lambeau". www.jsonline.com. Retrieved 2016-03-11. 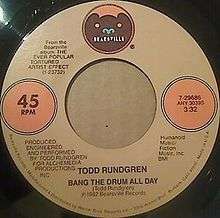 ↑ "Bang the Drum All Day by Todd Rundgren Songfacts". www.songfacts.com. Retrieved 2016-03-11. ↑ "Chart Stats - Todd Rundgren". chartstats.com. Retrieved 2011-11-25. 1 2 "allmusic ((( Todd Rundgren > Charts & Awards > Billboard Singles )))". Billboard. Retrieved 2011-12-17.